My artistic friend Eileen made these delicious scones and gave me the recipe (and this wonderful photo she took of them!) so I could share them with you, too! Eileen adapted her recipe from a cranberry scone recipe she found in a cookbook called Scones, Muffins, and Tea Cakes: Breakfast Breads and Teatime Spreads. These are buttermilk scones made without eggs, flavored with dried cranberries, almonds, and almond extract, and topped with a sweet touch-of-cinnamon glaze–doesn’t that sound yummy? Here is Eileen’s recipe…it makes 16 scones. Preheat oven to 400 degrees F. Lightly grease a baking sheet and set aside. In a large bowl, stir the flour, sugar, baking powder, baking soda, and salt. Add the butter and beat with an electric mixer until well blended. Add the dried cranberries and almond slivers. Pour in the buttermilk and almond extract and mix with spatula until blended. Gather the dough into a ball and divide in half. On a lightly floured board, roll into 2 circles, approximately ½ to ¾ inch thick. Cut each circle into 8 wedges. To make the glaze, combine the cream, cinnamon and sugar in a small bowl; set aside. Bake the scones on the prepared baking sheet for 12 to 15 minutes, or until they are golden. Remove scones from the oven and brush with glaze. Makes 16 scones. Isn’t that beautiful? 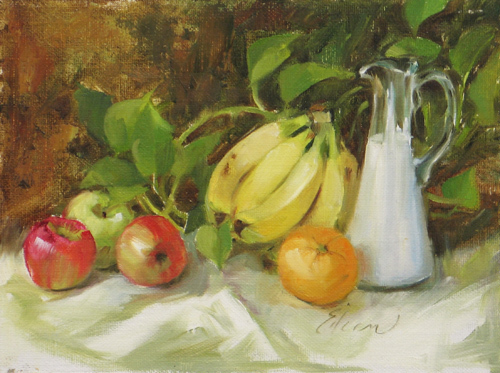 Eileen is involved in art shows from time to time and has her work shown in galleries, too. She is such a talented artist! 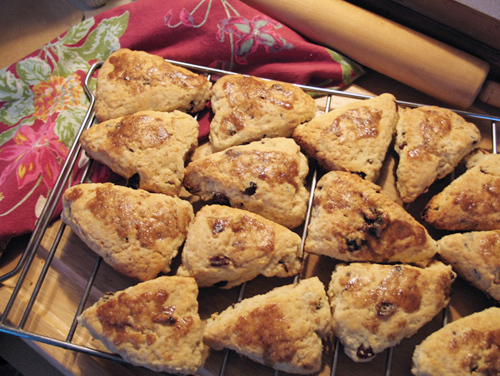 Thanks for sharing your wonderful scone recipe with us, Eileen! Linked to Sunday Showcase, Sundae Scoop, Potluck Sunday, Tasty Tuesday, Full Plate Thursday, It’s A Keeper Thursday, Foodie Friday, Sweet Tooth Friday. This entry was posted in Breakfast/Brunch, Creative Inspiration, Food and Recipes, Guest Chef, Muffins, Biscuits, Scones and tagged Almond, baking, Baking powder, breakfast, brunch, Butter, cinnamon, dried cranberries, Everyday, Flour, recipe, Scones, Sugar on February 4, 2011 by nancyc. I have really been wanting to make scones for a long time. I’ve never tried my hand at them but I think I really need to give it a try. You’ve inspired me! Thanks for letting me know, Christina! I love to bake and these scones look super delish. As I checked the list of ingredients I see that I’ve everything that I need in my pantry. Now I know what to bake on Saturday morning, please thank Eileen for the recipe, for me! You are right Eileen is very talented, I enjoyed getting to see her work. Your Cranberry Almond Breakfast Scones look so good. I would love to have one with my afternoon tea. Thank you so much for bringing your friends work and the scones to Full Plate Thursday and please come back! What a great flavor combination! Your scones look great. I love scones made from scratch. Great recipe! Congratulations, you are featured on Full Plate Thursday this week 2-17-11. You can stop by and pick up your Red Plate…hope to see you soon. Gorgeous painting! So realistic and beautiful. I do a lot of baking, but I have never tried to make scones. These look great, and I am wanting to try them. But I have a couple of questions.. I am assuming with the butter being cut up, it means cold butter, not softened. (basically cutting it in?)…. also, When putting them on the pan, do they need to be spaced? No problem, Tanya, and yes, the butter should be cold, and you should space them on the pan; otherwise, you’d need to recut them when they’re finished baking. Hope you like them!